A while ago we proposed our plans for player progression, and I’m pleased to let you know about some changes we’re wanting to make to improve the design. These changes come in two halves, one half is about how you gain experience which Luke will post soon, and the other half is about the skills you can buy once you’ve levelled up your character, and that’s what I’ll cover here. Blank Slate – all characters begin the game the same and can progress from there (i.e. no classes). Generalist or Specialist – characters can become very specialised in one area, or generalists, or anything in between. Free-form – skills are not pigeonholed into strict areas and players can make their own combinations (e.g. you decide what skills make a good hunter, you’re not told what we think are are good hunting skills). The design we proposed covered those points well, but there were a couple of areas that you highlighted in which it lacked. The things that I took away from the feedback was that the presentation was a little dry, and there wasn’t enough choice between two different skills or downsides to choosing a given skill. We want to address these issues, but without damaging our foundation concepts (especially number 3). So we’re looking to split the skills into more “trees”, which are more interestingly presented. Each tree is unlocked after you’ve bought a certain number of skills. These trees are grouped into themes, and contain a series of paths you can go down. Within each tree the cost of buying skills increases with each skill bought whether you are going further down a path or starting new paths. For example the Attributes tree, has a path of each of the eight Attributes (Vitality, Power, Control, Dexterity, Agility, Intelligence, Luck and Energy) and each path is eight steps long. The cost of each Attribute skill increases with each one bought, but that cost is the same whether you buy all eight skills in one path (i.e. max out an Attribute) or whether you buy the first upgrade in each Attribute. Each tree tracks its own cost, so at some point it becomes more cost effective to move to a fresh tree to pick up some cheaper skills. One other concept we’re looking at is the ability to “unlearn” skills. At any one time you can choose one skill to unlearn. After you’ve gained a certain amount of experience that skill is removed from your character and you get all the skill points back that you spent. In this way you can shift your character’s skills over time, and try things out without fear of committing permanently to something. Nice design, I just hope there’s enough options to allow specialist players to go about skills without having any unwanted skills just to open the tree. I just hope there’s enough options to allow specialist players to go about skills without having any unwanted skills just to open the tree. Im very sure thats what the community will find out and give feedback to :D. But if you ask me on path shouldn’t be TOO convenient either. It should just make sense in a certain way that these specific skills are in one path. Yeah if it’s too convenient, then there would be threads and threads going on how one skill build is better and there’s gonna be skills with no one using them. I find that each skill has it’s benefits and should seem like worse than some compared to them. Like you really need to decide between one or another and see different trees to make a choice. Looks great, desirable enough for people to have alts and specialise them, or a single character and generalise them. That is an awesome approach indeed, i just hope there won’t be too much restrictions in a way that i cant be multiple things at once if i want, especially for those who want to play alone. I think this is a great starting point. I feel that it should be tough to master something. So I believe if you master one thing and then you want to switch later you should not be able to just switch to that other skill and master that so easy. you should lose a certain amount of points and then have to level up again. So let’s say there is 3 levels to get to master level maybe you go back down to level 2 and then you have to grind again to get back to level 3. Other wise there is no consequences or hard choices for picking one skill over another. Sounds amazing! Will it be possible to unlock everything on one character (albeit impractical and hugely time consuming) or is it more of a finite nuber of points unlockable on one character that forces the player to choose what the “must haves” are for them? I see major pros and cons for each side of this. On one had its cool to have alts to specialize in things… but its not so fun to swich to an Alt everytime you switch activities to get the maximal effect. I would almost be in favor of one character per acct or some mechanic to limit such behavior. Another solution could be an unlockable dual spec system so a player could have a mining and a hunting spec they could swich to with some restrictions? Anyway can’t wait to see this in action! One other concept we’re looking at is the ability to “unlearn” skills. At any one time you can choose one skill to unlearn. After you’ve gained a certain amount of experience that skill is removed from your character and you get all the skill points back that you spent. I think you’re referring to that, from what I get, you have to accumulate experience to unlearn skills, you can’t just go and unlearn and assign skill points to other stuff. But I really get your point, it shouldn’t be that you can just switch skill sets as you please, but they give you the option to switch and tryout things if you want to give it time. It’s a rpg/mmo game, there needs to be some kinda grind. @olliepurkiss: One thing I’m still missing and that was requested a lot too, are “strong” final skills. I really like to see a strong skill at the end of a path (there should be a reason to finish a path). I’m looking forward to seeing this all in-game to give a detailed feedback. It’s currently a bit “abstract” to imagine what you really changed and what’s new. other way would be that there is a limit how many times you can switch all your skills, like in dark souls you can respec all your skills 5 times per playthrough. I’m in two minds about this, because I totally understand what you’re trying to achieve, but I don’t want to disadvantage players that want to be more generalist because they are less likely to get to the end of a path. As always these things are about balance. I’m putting some numbers to this now, and I’m trying to get some of the effect you’re after by scaling the skills up at the end of a path, but without them being massively epic. I look forward to getting this stuff out (probably initially on the testing branch) so you guys can have a look and comment more directly on what’s there. is that you guys arent really making it possible for a long term devoted player to master everything… or at least thats how it seems. meh, ive said before… i dont really like having to rely on other players. at all. i like being able to do it all so that i can be relied upon by others however/whenever. also, i dont like building by other players. In short, players stuff usually looks pretty wack to me. very few things ive seen in game built by players actually wows me or makes me want to be near it. i dont like the idea of player-builds cramping my style / aesthetic. all the cities ive seen look so wonky since there are no common themes linking builds. really. its all… mix and match. not really my thing. off topic but that makes (imo) the whole capitals aspect of the game and seeing stuff on planets very unfair. as such, id like to see the opportunity for players who want to master everything over time be able to do so. also it would be nice if there was a way to give rep to players for their builds so that the great architects of boundless dont have to group up with players in order to get some shine in the spotlight. if not strong skills then the ability to rank up skills individually more than once. such as putting points into a skill over and over for a better result. but this is sorta in tandem with being able to master it all, which is where id like to see it go. I think you’ll be able to do it all, just as you’re now. Just that it won’t be as efficient, let’s for example say you were to run a car wash all by yourself, you would be able to do all the steps required for the task, maybe be good in some and not so good in the rest, but someone who’s focused on a specific task, would do it much faster and better than you could. At the end, both you and the specialist are able to accomplish the task, with different results, what may have took you 20 minutes, he did it in 10.
the whole capitals aspect of the game and seeing stuff on planets very unfair. No one is impeding you from building your own huge building, since the devs have mentioned unlimited plots it’s thing, how hard it’s gonna be to get plots it’s another.Obviously a team of people working together is gonna have bigger chances at making a huge city, than a solo player, but that’s just how teamwork works. id like to see the opportunity for players who want to master everything over time be able to do so. also it would be nice if there was a way to give rep to players for their builds so that the great architects of boundless dont have to group up with players in order to get some shine in the spotlight. Good buildings are meant to catch the spotlight, no need for you to get in a city for it to be seen, or get with a group of people, take the hand @30nstillgaming made for example, he did it solo, nowhere near a city, and it caught some attention, because it was nicely done. People and devs liked it. It was a solo project and it got the spotlight. I think mastering everything should be an option, it should, but how hard it will be to earn skill points, how many skill points would be needed to do it is the key. Take for example getting a Major at a university, you could go and do 5 years to get your engineering major, then go for 5 more to get business, 5 more for economics, what you did in 15 years, 3 different people could do in 5 years each and work together to benefit from it. What you take to be able to do everything to the most efficient way possible, should be exponentially longer, than the combined time of a group of specialized individuals mastering their craft, if not, there wouldn’t be a sense in specialization. It should be an option, but not something so easy, that everyone ends up mastering everything and not relying upon others. What mastering everything would mean is getting players like you to enjoy the game, which it should, but it should be handled properly as to not weaken some other aspects of the game, as it’s communities, classes, and in general the MMO feeling of it. 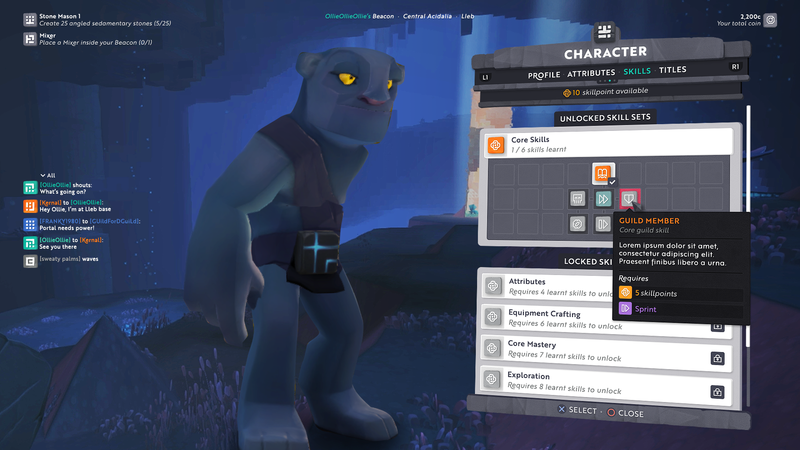 There’s actual games where you’re bound to one class, in boundless (Pun intended) it seems to be free, which limits and roadblocks put in motion, to limit choices, so you think through them. i would like to be able to master all skills. that means wash the car in ten. maybe it took me a lot longer to get there on my own, considering ive more options to fill over time than someone specializing but still able. the way the capitals work will be using some form of criteria in the game that determines what is and isnt showing to off world players when theyre looking up into the sky. to make clear my point, the cathedral painted by michaelangelo isnt famous because of the city built around it, but because of the art on the inside painted by one man. as such, there should be a way for players to attribute some form of notoriety to builds done by a single player. its not about size. its about creativity and effort. one of my shops is a small cave that looks better than many of the things ive seen so far in game and here on forums. that is my opinion of course. there were some pretty amazing builds from the java version of the game that were loner creations, that imo were more than worthy of attention and spotlight by having placement on a map. again its not about size. its about the quality of the workmanship, and players being able to +1 it into being hudworthy. yeah i read that last bit after my reply. essentially you understand what im saying, im glad youre for it. i dont think it should be any easier for one than many like you pointed out, only that we shouldnt be excluded. So, what I am getting here is that you don’t want to be a specialist because that may lock you into a single path, but you also don’t want to be a generalist because you then can’t do everything at maximum efficiency, you want to be some sort of… omni-specialist? Well, if it is possible to do that then why become anything else? And if everyone can be omni-specialized, why have any skills at all? Why not just have everybody start with exactly the same skill set from the start? Are you proposing that somehow only certain people should be allowed to be omni-specialized? And if you suggest that it should take a really long time to reach this point of omnipotence, then won’t you be spending a long time as a generalist anyway? If it’s just a matter of grinding to that point, eventually far too many people will reach the same point and there will be virtually no difference between players at all, and you’re back to my original conclusion , why have skills at all?